MPPFG is closed for business on all state and national public holidays. Thursday 3rd January onwards: Business as usual. 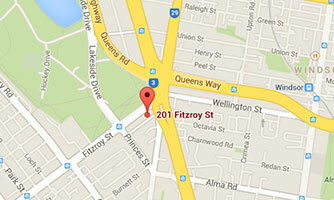 Ample parking is available along Pattison Street at the rear of the practice and Fitzroy Street at the front. There is a 50+ space car park at the corner of Pattison Street and Princes Street. Parking is available from approximately $3 per hour. Free 2hr parking is available 150m away from the practice in Octavia St, Charnwood Rd, Wellington St, St Kilda Rd, Princes and Barkly St. Please check parking signs when parking. Tram: The number 3, 3a, 5,16, 64, 67 all stop in the vicinity of our practice. Light Rail: The number 96 services the St Kilda Light Rail station, located 400m from our practice. Bus: The number 246 and 250 service our practice. The 600, 922, 923 arrive and depart from the light rail. 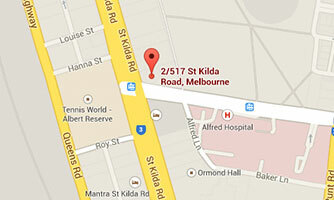 Limited timed parking is available in nearby side streets and on St Kilda Rd. Tram: Take any of the 3, 5, 6, 16, 64, 67, 72 trams, alighting at the Commercial Rd turn. 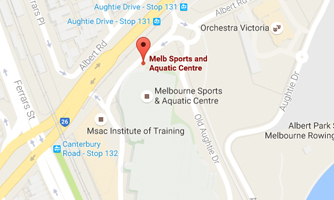 MSAC offers parking for approximately $3/hour* via Aughtie Drive, with over 500 car parks. Tram: Take the 96 and alight at stop no. 129 or the 12 tram and alight at stop no. 131.